Canton, 54 @ Archbishop Williams, 47 – Final – Sophomore Tony Harris had a double-double with 12 points and 10 rebounds while seniors Mike Harris and Rishi Jambunathan each chipped in with 11 points. 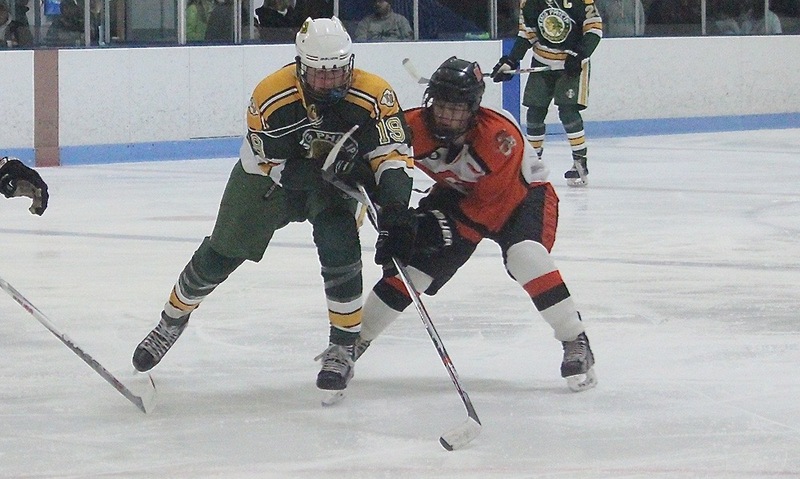 Foxboro, 1 @ Norton, 0 – Final – Paul Vey scored the lone goal of the game in the second period for the Warriors. Franklin, 4 @ Mansfield, 0 – Final – Sophomore Kenny Demerchant scored his first career goal while sophomore Brendan O’Reilly, junior Adam Assad and sophomore Jeremy Miller each scored once. Nick Jasinski had the shutout in net for the win. King Philip, 6 @ Taunton, 4 – Final – Taunton held a 4-1 lead through two periods but King Philip scored five goals in the third period to get the win. Oliver Ames, 7 @ Milford, 1 – Final – Eric LeBlanc scored a pair of goals, Jack Maloney and Matt Mancini each scored once and Korey Sweezy, Adam Healy and Cullen Gallagher each scored their first varsity goal in the game. FRANKLIN, Mass. – Heading into their first Hockomock game of the season, the Panthers seem to have solidified the blue line, but there are still question marks about who will provide the goals for the defending league champs. On Wednesday night at Pirelli Veterans Arena, senior Jake Downie and sophomore Jeremy Miller provided the offensive punch. The second line forwards contributed four goals and two assists to propel the Panthers to a 5-0 victory over visiting Oliver Ames. 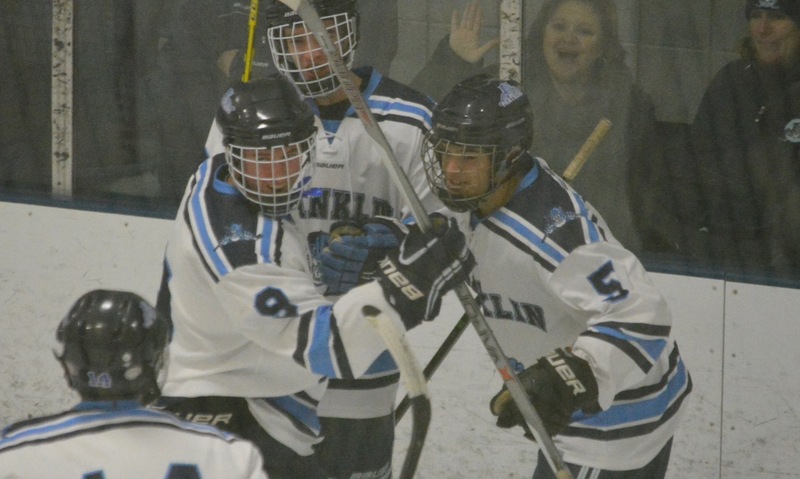 “Those two guys have been pretty consistent for us,” said Franklin coach Chris Spillane about Downie and Miller, who have been the team’s top scorers this season. The first line of Adam Assad, Alec Gilliatt, and Alex Bissanti started the game well, despite not having played in a full week due to a postponement on Saturday. Just four minutes in, Assad was robbed by a Zach Walsh kick save and just about three minutes later Gillatt set up Bissanti but Walsh went post to post to deny the point-blank chance. 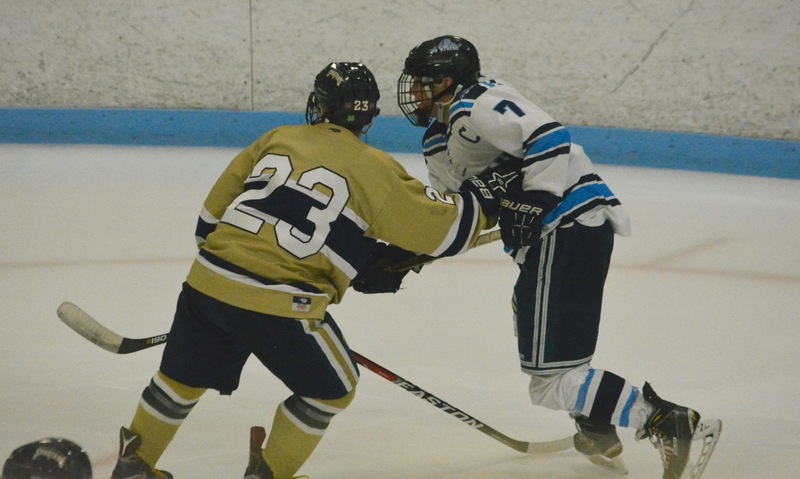 The Panthers dominated the first period, but could not find a way past Walsh. The sophomore made 11 of his 30 saves in the first and kept the Tigers in the game. But, in the second, Franklin finally found the breakthrough. A shot from the point by Stanley Carter was knocked down by Walsh and the puck sat in the crease for a second before Miller smartly tapped it to the left to a wide open Downie to finish into the open net. Although the Tigers only managed five shots in all three periods and spent long stretches in the defensive zone, OA had several scoring chances. Senior Ben Litwack was left alone in the slot with four minutes left in the first but his shot was right into the pads of Nick Jasinski and early in the second Jared Costello sped forward and forced the goalie into another good kick save. Assad nearly doubled Franklin’s lead less than two minutes after Downie’s opener, but his great move to get past the defense ended with a shot ringing off the inside of the post. Just 17 seconds into the third period, OA went on the power play, but the Tigers could not take advantage and did not get a shot on goal. Fifteen seconds after the penalty expired and with OA still pressed forward, a loose puck bounced onto the stick of Downie and he finished his breakaway to make it 2-0. “It’s unfortunate because that was a good opportunity and we didn’t capitalize,” said Homer of the power play chance. With 6:11 remaining the floodgates opened for the Panthers and it was another heads up play by Miller that broke it open. Freshman defenseman Kevin McKay fired a shot from the point that was blocked in front and Miller was first to react and flicked a shot past Walsh. Brendan O’Reilly managed to make it 4-0 on a fluky goal after Walsh had saved the original chance. The puck was cleared off the Franklin player’s leg and looped over the stranded goalie. With just 42.5 left, Downie picked out Miller with a perfect pass on an odd-man rush and the sophomore tapped it in to complete the scoring. Homer insisted this was a learning experience for the Tigers (3-2, 1-1) early in the season, including for his sophomore netminder, who is trying to fill the pads of graduated goalie Jimmy Tierney. The Panthers (3-3-1, 1-0) are back to .500 after the win, but Franklin has also played a very difficult schedule that has included perennial powers from Massachusetts, Rhode Island, New Hampshire, and Connecticut. According to Miller, the early competition has forced Franklin to improve quickly. OA will host Attleboro on Saturday, while Franklin will travel to Foxboro. Attleboro, 66 @ Durfee, 76 – Final – Attleboro was even with the Hilltoppers at the end of the first quarter but was outscored by 15 points over the second and third quarters. Jake Dunkley led the Bombardiers with 21 points and nine rebounds, Nate Douglas had 15 points and Kyle Murphy had 11 points and 15 rebounds. Attleboro, 74 vs. Durfee, 40 – Final – Attleboro let throughout, including a game-high 28 points from senior Emily Houle. Junior Sarah Deyo added 21 points and Samantha Pierce had 10 points. Stoughton, 57 vs. Fontbonne, 68 – Final – The Black Knights got within three points in the third quarter but couldn’t complete the comeback. Alecia Quinones had a team-high 15 points and Ava Siegel had nine points for the Black Knights. Milford, 1 @ Attleboro, 6 – Final – Jake Parker scored a hat trick and PJ Elliott had three assists for Attleboro. Milford’s Brian Ireland made 30 saves in goal. Oliver Ames, 0 @ Franklin, 5 – Final – Jake Downie and Jeremy Miller had two goals and an assist apiece to lead the Panthers. Brendan O’Reilly had the other goal for Franklin and Nick Jasinski recorded 15 saves for the shutout. OA goalie Zach Walsh made 30 saves in the loss.